Website conversion tips for optometrists, to better market your eye care center for more Lasik and contact lens patients. Write content on your optometry website (especially your homepage) as if you are having a conversation with one person. The content should be all about them and what they get, not you and how accomplished you are. This early on, people want to know what you can do for them in the first 5 seconds or they are gone for good. One test to check your content is to see how often you mention “we”, “I” or “us”, instead of “you” and “your”. This will be a learning curve for you to check all your content and revise it. Tip #2. Highlight your highest profit optical services near the top of your website – for example Lasik and contact lenses. So often we see business websites with a big, non-relevant image taking up the entire first fold of the website, with no value or benefit to the visitor. Instead, pick your top 3 highest profit services and have them near the top. This is an effective design strategy to help people looking for those specific services like Lasik or contact lenses to be able to find them quickly on your optometrist website and not your competitors. Once you’ve determined the 3, have a relevant image for each one, with a brief 1-3 sentence intro, and link it to your main page for that service. You want those sentences to hit the pain points of your visitor to get the wanting to read more. Video is exploding on the Internet. With over 60% of people searching on mobile devices you want to take advantage of this and add video to your homepage, all service pages and a patient testimonial page. Even in 2018 most of the eye doctors do not use video. The length of each video should be short. 60-90 seconds with no fluff. Don’t waste your intro stating your name, business name, etc. Instead, talk directly to the viewer about the topic and quickly answer the top 2-3 questions about that topic. Your homepage video should also be short and all about the viewer, not YOU! Having a real patient testimonial video at the top of your Lasik, Contact Lenses, and other profitable services pages will increase conversions dramatically. People fear Lasik surgery, so to watch a story of someone who went through it and how it changed their life is impacting to your web visitor. Tip #4. 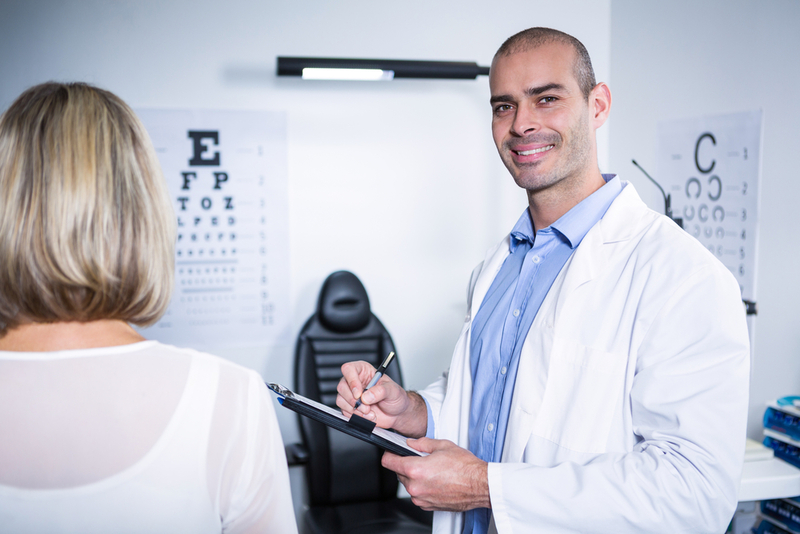 Offer a white paper on Lasik to educate your visitors. Lasik surgery is a big decision both emotionally and financially. Create a downloadable white paper that addresses all the questions and concerns a potential patient has. Don’t make it to clinical or long. Preferably 3-5 pages maximum. Have it on every page of your website requiring their name and email address to download it. This creates a follow-up opportunity via email marketing. Remember, it may take them up to 7-12 touches to make a decision. Tip #5. Use retargeting to increase your new patient revenues. I am quite surprised when I review an optometry website and do not see a retargeting pixel on it. This is a massively lost opportunity to show your brand over-and-over again to a visitor of your website on both Facebook and other 3rd party web properties they visit on a regular basis. A typical number for website conversions is 1%-3% That’s it! People most of the time will not take an action on their first visit. If you don’t retarget them, you will possibly lose them forever. Tip #6. Have 2-3 calls-to-action on every page for what your main goal is. There is really only one main reason for your optometry website to exist. To get people to contact your office and schedule an appointment. With that being said, every page should have several calls-to-action. We refer to a call-to-action as “Schedule An Appointment Today”, “Click Here To Book Your Consultation”, Call 555-555-5555 Today To Schedule Your Consultation”. People need to be able to easily find out how to contact your office. And they shouldn’t have to search for it to do it. That is why having 2-3 per page strategically positioned will dramatically increase conversions on your website. Tip #7. Phone number and map on every page of your website. You never want to make people look for your office phone number or where your office is located. You must have a prominent (bigger) phone number in upper right corner of every page. Your google map can be in the footer at the bottom, but make sure it is on every page as well. Also have your office hours easily viewable, as well as an easy-to-fill-out form on every page if people are not ready to call, but they are interested in someone from your office contacting them. Conclusion. These tips just scratch the surface of how you can turn your optometry website into a conversion machine, that gets you more booked appointments, and ultimately more patients and revenues. Contact me for a no-pressure consultation to discuss your specific goals.